Frances Ramsay Simpson (b. c.1812 - d. 1853), the daughter of a London merchant, married her cousin, HBC Governor George Simpson, in 1830. She initially accompanied him to Rupert's Land but her health deteriorated during her first pregnancy, and she was often an invalid therafter. Her husband settled her first in London and then in Lachine, where she died after giving birth to her fifth child. This entry is dated May 25th 1830 at Fort William, where the Simpson party had a day's rest on their way from Lachine to York Factory. 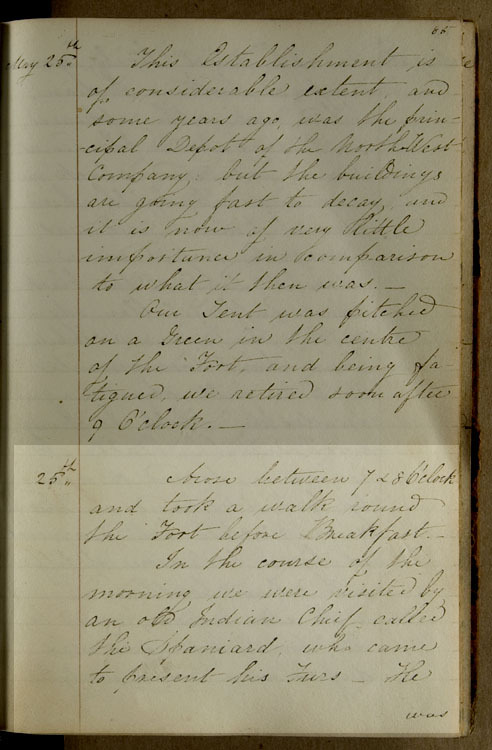 p15, 6th pgh: "Arose between 7 & 8 o'clock...well satisfied." "25th Arose between 7 & 8 O'clock and took a walk round the Fort before Breakfast. In the course of the morning we were visited by an old Indian Chief called the Spaniard, who came to present his Furs. He was the most lively, good-tempered looking Indian, I had met with; appeared both surprised & pleased at seeing me, and shook me very cordially by the hand several times. He was very gaily dressed in a Scarlet Coat, with black velvet cuffs & collar, edged with gold lace - a White Calico Shirt ornamented with a frill about ½ a yard in depth - cloth Stockings worked with beads, an immense Sword dangling by his side, and an enormous cocked hat, surmounted by a profusion of different colored feathers. He was accompanied by his son-in-law, who was dressed in a similar style, tho' his clothes were of plainer colors - he was a young Man, and paid great deference to his Father. After making a long speech, and receiving a present of Liquor, Tobacco, Beads & Cloth, they took their departure, apparently very well satisfied." Read excerpts from Frances' journal - enter 'Frances' in the search box to your left. What does Frances Simpson look like? Discover a personal object that once belonged to Frances. It was customary to give a gift of tobacco when making new acquaintances or creating potential business relationships. Check the Beaver Index - e.g., Journey for Frances [Parts 1-3], by Grace Lee Nute, December 1953, March 1954 and June 1954. Although 'trading captain' was a title bestowed by the European traders, it was principally a recognition of authority and influence already held by Native chiefs and other First Nations leaders.